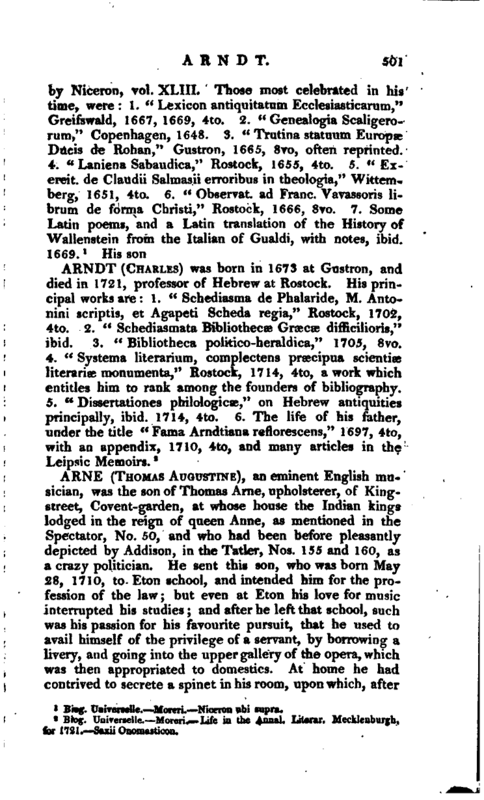 , an eminent English musician, was the son of Thomas Arne, upholsterer, of Kingstreet, Covent-garden, at whose house the Indian kings lodged in the reign of queen Anne, as mentioned in the Spectator, No. 50, and who had been before pleasantly depicted by Addison, in the Tatler, Nos. 155 and 160, as a crazy politician. He sent this son, who was born May 28, 1710, to Eton school, and intended him for the profession of the law; but even at Eton his love for music interrupted his studies and after he left that school, such was his passion for his favourite pursuit, that he used to avail himself of the privilege of a servant, by borrowing a livery, and going into the upper gallei’y of the opera, which was then appropriated to domestics. At home he had contrived to secrete a spinet in his room, upon which, after | muffling the strings with a handkerchief, he used to practise in the night while the rest of the family were asleep, His father, who knew nothing of this, bound him to a three years’ clerkship, during which this young votary of Apollo dedicated every moment he could obtain fairly, or otherwise, to the study of music. Besides practising on the spinet, and studying composition, by himself, he contrived to acquire some instructions on the violin, of Festing, a performer of much fame at that time; and upon this instrument he had made so considerable a progress, that soon after he quitted his legal master, his father accidentally calling at a gentleman’s house in the neighbourhood, was astonished to find a large party, and a concert, at which his son played the first fiddle. His father was at first much irritated at this disappointment of his hopes, but was soon prevailed upon to let his son follow the bent of his inclinations; and the young man was no sooner at liberty to play aloud in his father’s house, than he bewitched the whole family. In particular, he cultivated the voice of one of his sisters, who was fond of music, by giving her such instruct tions as enabled her to become a favourite public performer. For her and for a younger brother, who performed the character of the page, he set to music Addison’s opera of Rosamond, which was performed at Lincoln’s Inn Fields, ten nights successively, and with great applause. 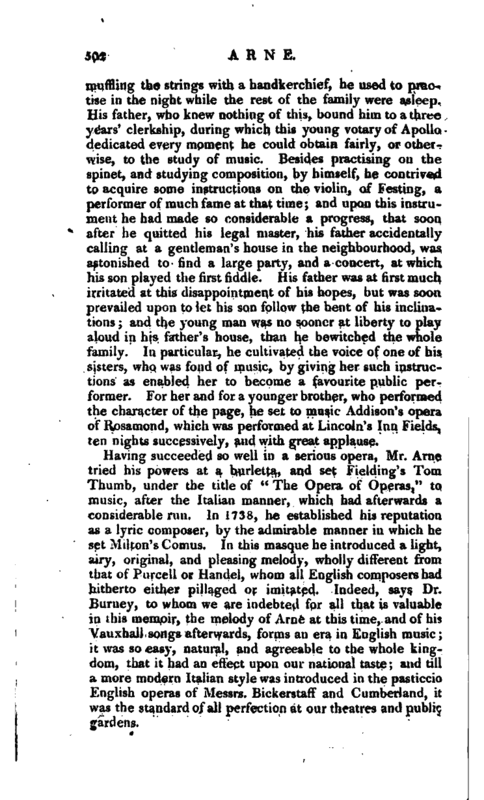 Having succeeded so well in a serious opera, Mr. Arne tried his powers at a burletta, and set Fielding’s Tom Thumb, under the title of “The Opera of Operas,” to music, after the Italian manner, which had afterwards a considerable run. In 1738, he established his reputation as a lyric composer, by the admirable manner in which he set Milton’s Comus. In this masque he introduced a light, airy, original, and pleasing melody, wholly different from that of Purcell or Handel, whom all English composers had hitherto either pillaged or imitated. Indeed, says Dr. Burney, to whom we are indebted for all that is valuable in this memoir, the melody of Arne at this time, and of his Vauxhall songs afterwards, forms an era in English music; it was so easy, natural, and agreeable to the whole kingdom, that it had an effect upon our national taste; and till a more modern Italian style was introduced in the pasticcio English operas of Messrs. Bickerstaff and Cumberland, it was the standard of all perfection at our theatres and public gardens, | In 1762, Arne quitted the former style of melody, in which he had so well set Comus, and furnished Vauxhall and the whole kingdom with such songs as had improved and polished our national taste; and when he set the bold translation of Metastasio’s opera of Artaserse, he crowded the airs with all the Italian divisions and difficulties which had ever been heard at the opera. This drama, however, by the novelty of the music to English ears, and the talents of the original performers, Tenducci, Peretti, and Miss Brent, had very great success, and still continues to be represented whenever singers of superior abilities can be procured. 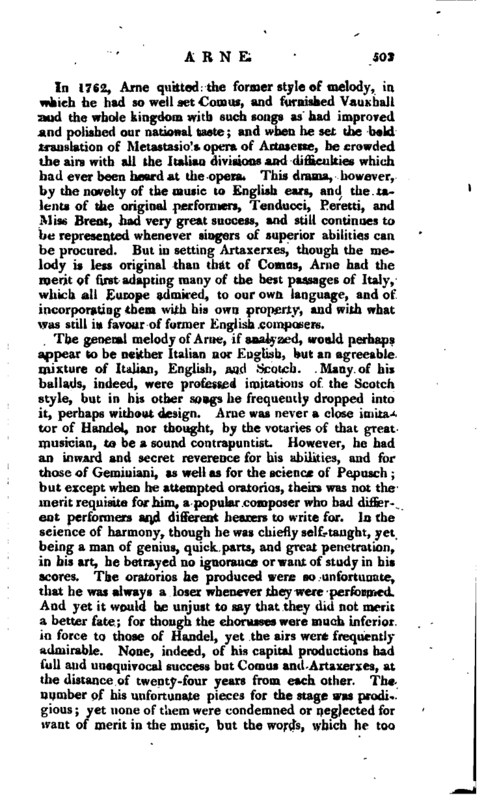 But in setting Artaxerxes, though the melody is less original than that of Comus, Arne had the merit of first adapting many of the best passages of Italy, which all Europe admired, to our own language, and of incorporating them with his own property, and with what was still in favour of former English composers. The general melody of Arne, if analyzed, would perhaps appear to be neither Italian nor English, but an agreeable mixture of Italian, English, and Hcotch. Many of his ballads, indeed, were professed imitations of the Scotch style, but in his other songs he frequently dropped into it, perhaps without design. Arne was never a dose imitator of Handel, nor thought, by the votaries of that great musician, to be a sound contrapuntist. However, he had an inward and secret reve.renc.e for his abilities, and for those of Geminiani, as vvejl as for the science of Pepusch; but except when he attempted oratorios, theirs was not the merit requisite for him, a popular composer who had different performers and different hearers to write for. In the science of harmony, though he was chiefly self-taught, yet being a man of genius, quick parts, and great penetration, in his art, he betrayed no ignorance or want of study in his scores. The oratorios he produced were so unfortunate, that he was always a loser whenever they were performed. And yet it would be unjust to say that they did not merit a better fate; for though the chorusses were much inferior in force to those of Handel, yet the airs were frequently admirable. None, indeed, of his capital productions had full and unequivocal success but Comus and Artaxerxes, at the distance of twenty-four years from each other. The number of his unfortunate pieces for the stage was prodigious; yet none of them were condemned or neglected for want of merit in the music, but the words, which he too | frequently wrote himself. 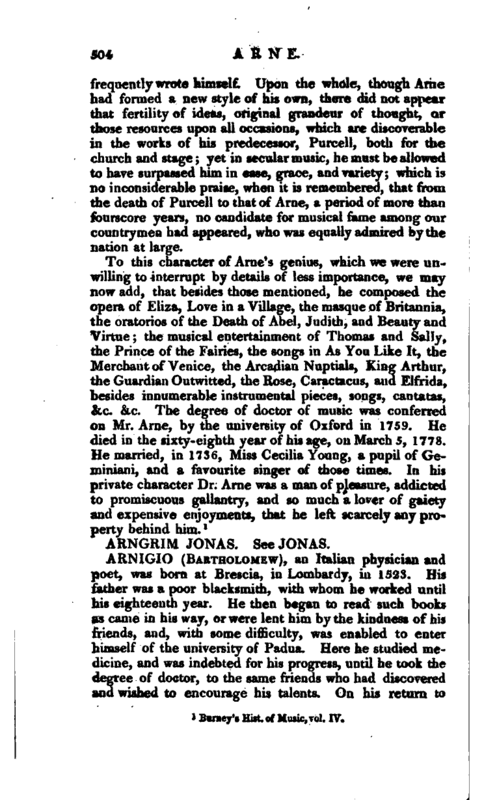 Upon the whole, though Arne had formed a new style of his own, there did not appear that fertility of ideas, original grandeur of thought, or those resources upon all occasions, which are discoverable in the works of his predecessor, Purcell, both for the church and stage; yet in secular music, he must be allowed to have surpassed him in ease, grace, and variety; which is no inconsiderable praise, when it is remembered, that from the death of Purcell to tnat of Arne, a period of more than fourscore years, no candidate for musical fame among our countrymen had appeared, who was equally admired by the nation at large. Barney’s Hist, of Music, vol. IV.